Almost all forms of motorsport around the world closed with the outbreak of World War 2,Fuel rationing was a major problem and motorsport was considered as a luxury. 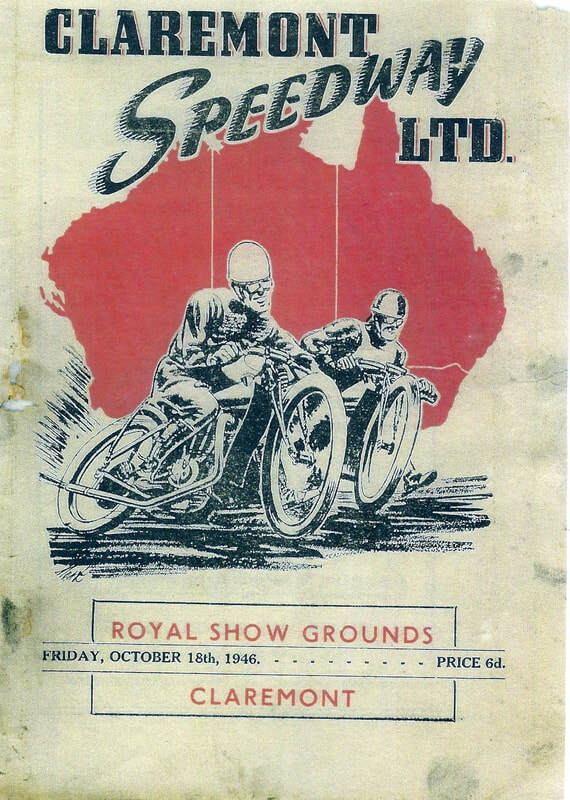 By war's end the motorsport population were reopening venues world wide, and one of them was the Claremont Showground Speedway, The opening was on the 18th of October 1946. 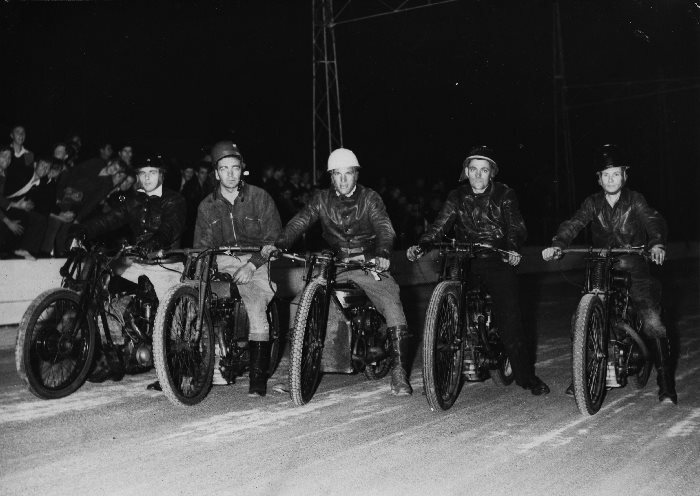 Following World War 11, Claremont Speedway reopened on the 18th of October 1946, with a traditional program of motorcycle solo and sidecar racing events. 26,000 spectators packed the showground to witness that 23 event program. 1946 A Clarke winner of heat 3. Bluey was a wild man, worked hard breaking in horses to make a living for himself and his young bride, He was attracted to the world of racing motorcycles around the big Claremont Showground Speedway and did so with impresive results. As time passed and the Meakins family grew larger with the addition of children Bluey gave an undertaking to his wife that he was going to give up the racing and danger's attached to this Friday night ritual. 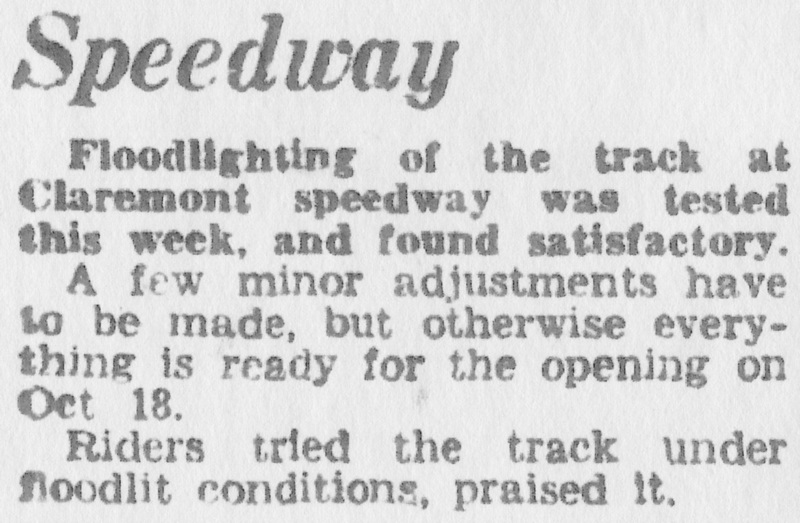 As history will show Bluey's name was still showing up in speedway results at Claremont Speedway, even after his children were born, as it was Bluey who was away breaking horses and earning the weekly pay checque was in fact still racing, un-be-known to his family. Bluey would end up being killed in an car accident, later while his children were quite young, cleaned up by a drunk driver, This drunk was a well known Perth businessman that Bluey's wife still to this day, chooses to keep to herself. Bill Lydiate recalls: John Ross was my cousin, He died in 2007 in Maylands. I had met and talked to him about six months prior, and he spoke about his bike days, and his interest in watching the current Moto GP series etc. He was still riding motorcycles into his eighty's, Born in 1917, he was about ninety when he died, He recalled to me many of the old riders including the Nicol's. 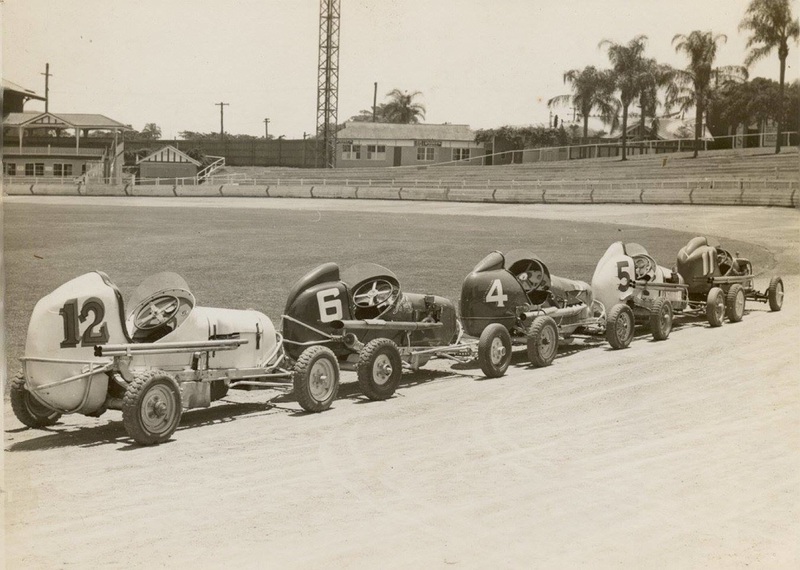 1947 Claremont Speedway. Photo: unknown. Rick Thompson recalls: This signature come picture book has been in my family since my parents moved from Nannup to Perth, The book is dated 1947 and I have yet to meet anyone that remember its, let alone anyone that owns one, Rick says it is his most priced item in his vintage speedway collection, because of its family ties. Chum Taylor as we all know him also has a family name Edwin Vernon Taylor, Chum went on to be one of Australia's greatest speedway riders of the early years, he started riding at Claremont Speedway in 1948 on a Rudge machine. In 1960 Chum travelled to England's Wembley Stadium to represent Australia in the world finals. Chum went on to win the Australian solo championship at Rowley Park South Australia in the 1965 - 1966 season. Chum at the age of 46 retired in 1973. 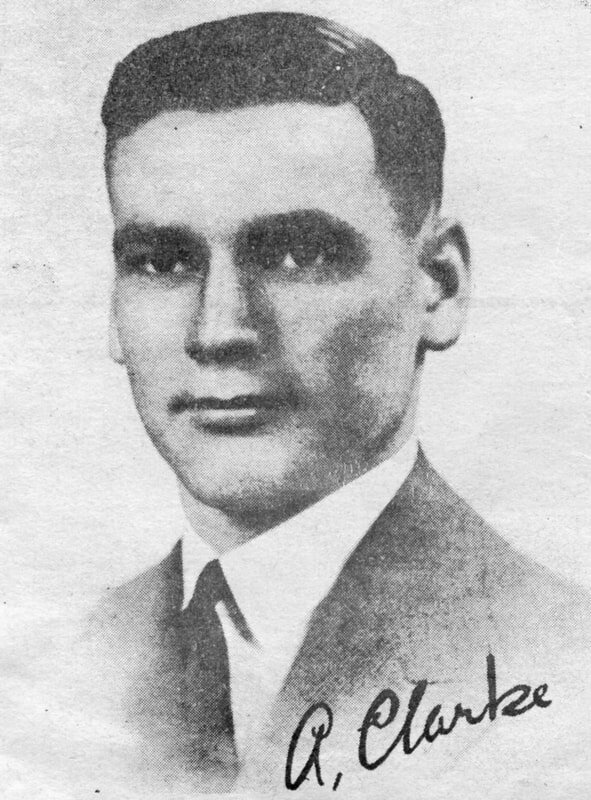 John Hamilton started racing speedcars during the 1951 - 1952 season. John would loose his life on the 15th of Febuary 1957 at Claremont Speedway, after his was involved in a multi car accident, he was driving the gold number fourteen car of George Bromley. 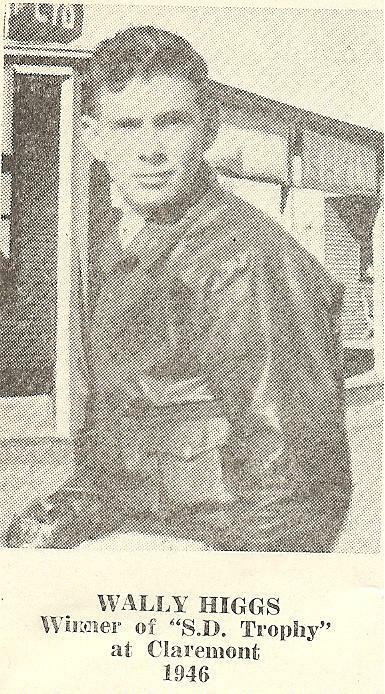 Wally Higgs West Australian Solo Champion 1950-1951 1951-1952. Photo Nola Whitehead collection. Kevin Bernard Kestel was born on the 31st of September 1930 in the family home at 38 Arundle Street in Fremantle. Kevin started racing speedcars at Claremont Speedway during the 1954 - 1955 season, His speedcar was powered by a Holden Grey motor. At the time he was racing he owned the Shell Service Station opposite Port Beach, near the Dingo Flour Mill. Due to family pressure's Kevin decided to retire from speedcar racing during the 1956 - 1957 after a massive accident that he and other drivers got tangled up in took the life of fellow driver John Hamilton. Miles Tomlinson WA Sidecar champion 1953-1954 1954-1955 pictured centre. Photo: Nola Whitehead collection. 1955 Gordon Bell makes some adjustments to his number 2 Chrysler flat head midget in the Claremont Pits while Stan Fairfield looks on - Photo: Rick Thompson collection. 1955 Gordon Bell in the #6 Midget. Photo's: Ken Devine. 1955 Gordon Bell in the 55 speedcar on the outside of Mike Prenergas 8 at Claremont. Photo: unknown. Bob began racing scrambles at the age of sixteen, he was a member of the AJS Club and rode a 350 Ariel. At the completion of that 1956 winter season Bob was lurered to the Claremont Speedway summer season by the offer of loaned JAP machine from chum taylor, as the next few years progressed Bob returned the loan bike and entered into a sponsorship deal with side car great and Subiaco motor cycle shop owner Mick Hutton. Around 1963 Englishman Ken McGinley after touring Australia offered his machine for sale and Bob and his farther brought the bike. Bob would finish the Claremont season that year and in 1964 along with his good mate George Summers, the pair would ship off to England and both ride for the Exetor Falcons. A few years later Bob would return to Perth but never race speedway again. On returning Bob went black track racing at Caversham for one year untill it closed, and he married. From 1967 through to about 1992 Bob enjoyed his road racing hobby starting in a formular two, after Caversham closed Bob continued to race at the new Wanneroo circuit until the lack of racing in WA forced the family to Sydney and base their racing out of Oran Park. In about 1990 Bob moved back to WA and continued racing formula V's at Wanneroo until he retired in 1992. George would travel to England in 1964 with his good friend Bob Innocent where they would both ride for the Exetor Falcons. George would later ride for Plymouth and Shefield. Bill Brown originally built this bike for Harry Taylor with a 650 Triumph engine mounted in it, Harry had raced the outfit for a long period of time and was never phased by the fact he was up against the big 1000cc Vincent's on the big Claremont Showground track, The sheer cost of owning a Vincent engine was way beyond the means of Bill and Harry. Later on Bill decided to fit a Triumph engine, and it was not unusual for them to remove the engine after racing at Claremont on the Friday night and refit it to a road race frame and compete at Mandurah or Bunbury or Collie in the around the houses events on the Saturday, or at the Caversham Airfield circuit. During the 1958 season New South Wales Speedcar driver Johnny Stewart made an appearance at Claremont Speedway, This meeting would be a disaster for Stewart after he rode a wheel in Pit corner and somersaulted many times but was unhurt, With the help of some volunteers the car was repaired during the week and was back on the track the following Friday night. American racer and superstar Bob Tattersall was a regular to all the major tracks around Australia during 1958. Laurie Mathews was a highly respected speedcar driver, he began his racing in 1960 and was credited with twenty one feature race wins at his home track Claremont Speedway. Tragically Laurie lost his life in a road accident while traveling to the east coast to compete in 1987.since his death WA,s premier speedcar event has been named after the great man, The Laurie Mathews Memorial.